It's situated right on the edge of Chorleywood Common, and has a few picnic benches out the front, looking onto the common. Entry is into a traditional bar area, and at the back is a 24-cover restaurant area with table service and tables laid out with tablecloths, napkins, cutlery, and wine glasses. 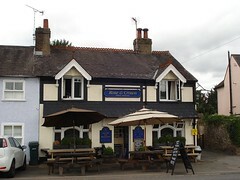 According to the 2011 Good Beer Guide, some of the bar area may be annexed for diners at busy times. There are four handpumps on the bar, which on our August 2013 visit were clipped for London Pride, Young's Bitter, Windsor & Eton Parklife, and Tring Rib Tickler; a board on the wall made it clear that the latter two were guests (and hence the Pride and Young's would be regulars). Kake visited on a Friday lunchtime in August 2013. The outside seating was all free, but inside the bar area was completely full. Since I wanted to have lunch, I was directed to the restaurant, which was empty when I arrived around 12:15pm, though two other customers appeared during my visit. No music was playing. On being seated in the restaurant, tap water was offered immediately, with no need to request it. I had a pint of lime and soda instead (£2.50). Pan-fried pork loin with black pudding and a cider and cream sauce (£12 including veg and mash) photo was pretty good; simple British food done well. The black pudding complemented the pork very well, the accompanying carrots and cabbage weren't overcooked, and the mashed potato that came on the side was creamy and well-seasoned. According to their website as of August 2013, food is served noon-2pm and 6:30pm-9pm Mon-Fri, noon-2pm and 6:30pm-9:30pm Sat, and noon-4pm Sun. According to their website as of September 2011, they're dog friendly (although as of August 2013 this note has vanished from the website). Accessibility: A small step followed by a tight bend to get into the bar area. Three steps with handrail to get from the bar area to the ladies', and one more step from here to get to the restaurant. There's a car park at the back. Last visited by Kake, August 2013. Opening hours taken from sign outside and verified on the Rose & Crown website, August 2013. Last edited 2016-09-18 15:54:38 (version 10; diff). List all versions. Page last edited 2016-09-18 15:54:38 (version 10).